When we began traveling full-time in 2015, we knew we needed to invest in some leveling blocks. Everyone told us we would be using them often, and they were right. We use them nearly every time we set up, but recently we began having problems with them. Now that we are primarily boondocking in the middle of nowhere, we have found it incredibly hard to level our Airstream using these square blocks. Being that they are only capable of one inch increments, we have been growing increasingly irritated at not being able to get the Airstream perfectly level. With two little ones sleeping on top bunks, we want to make sure they aren't going to roll out of their beds. One of our rescent trips had us visiting friends in Boise, ID where we parked on the street in front of their home. We attempted to level up one side with the square blocks but they just scooted along the pavement as we tried to roll up onto them. I was getting quite frustrated but then our friends were like, “Use our Andersen Levelers!” The clouds parted. The sun shone bright. Birds flew overhead singing praises. Okay, not really...but we rolled up on those suckers SO easily. We just kept rolling back until we were perfectly level. Plus, they double as wheel chocks! Where have these been all of my life? That week we called up our friends at ETrailer. They sent us our very own Andersen Levelers to try out and review, and holy smokes! Why didn’t we get these sooner? There’s no more guessing how many blocks will get the job done. We just put these in front of our tires (or behind them) and roll onto them until our level tells us to stop! It took a good 5-10 minutes off of our setup time (sometimes more if we’re in a really crazy place). My favorite part about the Andersen Levelers is that you aren’t limited to one inch increments. You can literally go anywhere from 1/2” to 4”. Game changer! They’re so easy to use, even the kids have learned how to do it! These Andersen Levelers are definitely making the list of 'must haves' when we talk to people who are new to RVing. We’ve got to give a huge THANK YOU to ETrailer for hooking us up! 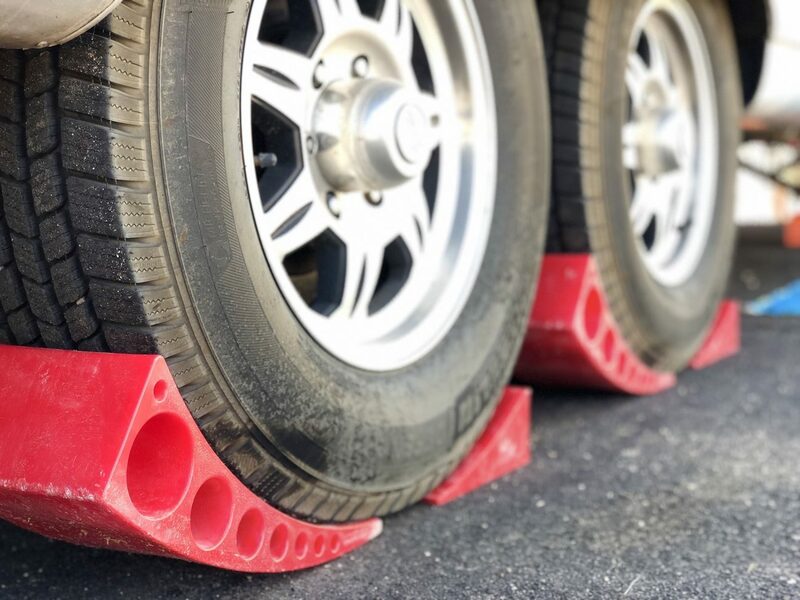 If you’re looking for a better (and easier) solution to leveling up your trailer...look no further! Buy a Set of Anderson Levelers Now!